Bias and the Evidence ‘Biased’ Medicine. Case Reports – Their Value in Training. Delayed Presentation of Metacarpophalangeal Joint Dislocation of the Thumb in Children Requiring Open Reduction: Two Cases Reported and Review of Literature. Single Stage Tibial Osteotomy and Long Stem Total Knee Arthroplasty to Correct Adverse Consequences of Unequal Tibial Lengthening with an Ilizarov Circular Fixator. Late Stage Freiberg Infraction in a Division I Collegiate Tennis Player. A Rare Case Of Non Traumatic Myositis Ossificans Circumscripta. Soft Tissue Swelling Associated with the Use of Recombinant Human Bone Morphogenetic Protein-2 in Long Bone Non-unions. 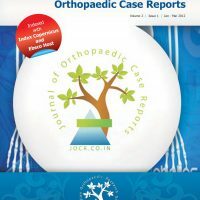 Unilateral, Multifocal Fracture of Radial with Ipsilateral Midshaft Ulna Fracture – Two Such Unusual and Rarely Reported Cases. Intra-Pelvic Migration of Sliding Hip Screw During Osteosynthesis of Hip Fracture: A Rare Avoidable Intraoperative Complication. Easy and Inexpensive Technique for Removal of Round Headed, Jammed Locking Screws in Distal Tibial Interlocking Plate. Rare Case of Rhizomelic Chondrodysplasia Punctata. Single Stage Treatment of Non – Union of Transcervical Neck Femur Fracture with Shepherd Crook Deformity of Proximal Femur in A Case of Fibrous Dysplasia using Dynamic Hip Screw Fixation. An Unexpected Complication of Residual Fibular Strut Graft While Performing A Press fit Hemiarthroplasty for A Secondary Nonunion Fracture Neck of the Femur. Spontaneous Dissociation of Anatomic Medullary Locking A Plus (AML A Plus) Femoral Component at the Head-Neck Interface. A Rare Case of Pubic Ramus Osteochondroma. Reconstruction of Mirror Foot with Dysplastic Tibia. 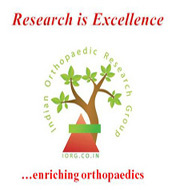 External Fixation Vs Orif in the Treatment of Bilateral Calcaneum Fracture. Are Two Surgeries Necessary for Correction of 1 Deformity- Cervical Kyphosis in Neurofibromatosis?- A Rare Case Report. Pigmented Villonodular Synovitis Presenting as a Popliteal Cyst. Bilateral Femoral Neck Fractures in A Young Patient Suffering from Hypophosphatasia, Due to A First Time Epileptic Seizure. Ganglion Cyst of Knee from Hoffa’s Fat Pad Protruding Anterolaterally Through Retinacular Rent: A Case Report. A rare case report of Patellar Osteochondroma. Isolated Proximal Fibular Stress Fracture In Osteoarthritis Knee Presenting As L5 Radiculopathy. Acute Knee Pain in a Child Due to Pigmented Villonodular Synovitis. Atraumatic Bilateral Neglected Anterior Shoulder Dislocation: Case Report of a Jehovah’s Witness 28-Year-Old Male Affected by Iron-Deficiency Anemia and Treated with Bilateral Latarjet Procedure. Streptococcus pyogenes Associated Post-traumatic Brodie’s Abscess of Cuboid: A Case Report and Review of Literature. Mucoid Degeneration of the Anterior Cruciate Ligament: A Case Report and Review of Literature. Degenerative Sacrolisthesis of S1-S2: A Case Report. Myositis Ossificans of Rectus Femoris: A Rare Case Report.